This circuit sounds uncannily reminiscent of the Rockman units from the 1980s, minus the compression. Distortion is created by overdriving the op-amps, similar to the Sansamp units. Adding the optional Red LEDs will result in an even closer copy of the Rockman sound. 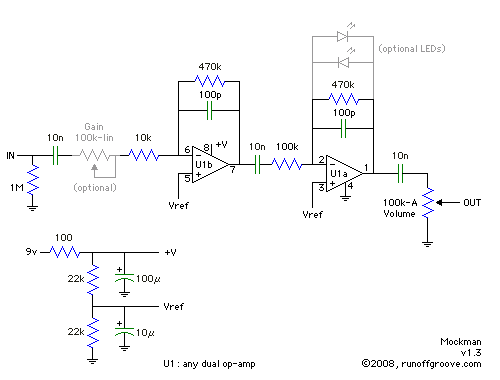 When including the LEDs, reduce the 470k resistors to avoid over-distorting. You can also increase the 10k resistor for less overdrive. Mockman by runoffgroove.com is licensed under a Creative Commons Attribution-NonCommercial-ShareAlike 3.0 Unported License.